Pāʻū riding for Kamehameha Day a hundred and ten years ago! 1906. Picturesque Cavalcade Revives Old-Time Custom. The Hui Holopa-u Maile Alii have every reason to be satisfied with their first parade as a society, which occurred yesterday in celebration of Kamehameha Day. The custom of pa-u riding is an old and kingly one and it was eminently fitting that the initial gathering of the club should take place on the anniversary of the birth of Hawaii’s greatest king. in honor of the Kalakaua Dynasty which ruled over the Hawaiian Islands for 22 years, Honolulu will celebrate tomorrow, and the day will be filled with many pleasant features. The big affair of the day will occur in the evening when the reception and ball at the armory will be held. Because of the illness of Queen Liliuokalani, she will not be able to attend, but in her place Prince and Princess Kalanianaole will receive the guests. After the reception three orchestras will furnish music for the dancing and a gala time is anticipated. A large number of invitations have been issued and to be sure that no one was overlooked Princess Kawananakoa chairman of the invitation committee, wishes all who have not received invitations to go to the Promotion Committee rooms on Bishop street. The festivities of the day will begin in the morning when 21 pa-u riders will gather at Princess Auto Stand on King street and from there, headed by Princess Theresa Wilcox, president and wife of the first delegate to congress, and Mrs. J. Fern, vice-president, will march up King street to Aala park. From there the march will return on King and up Fort, to Hotel, then Bishop, King and up Richards to the residence of Queen Liliuokalani, where a short call will be made. From the queen’s residence the riders will follow Beretania street to Pensacola street to the home of Princess Kawananakoa, where a reception will be held from 9 to 12 in the morning. Here a short speech will be made by a member of the riders. In the evening the pa-u riders will attend the ball in full costume of royal purple with leis around their necks and a golden band on which is the word “Kaohelelani,” the name of a descendant of the royal house of Keoua, the father of the Kamehamehas. The reception of Princess Kawananakoa is for Hawaiians only and therefore no one else will be permitted inside the grounds unless they have a special invitation. 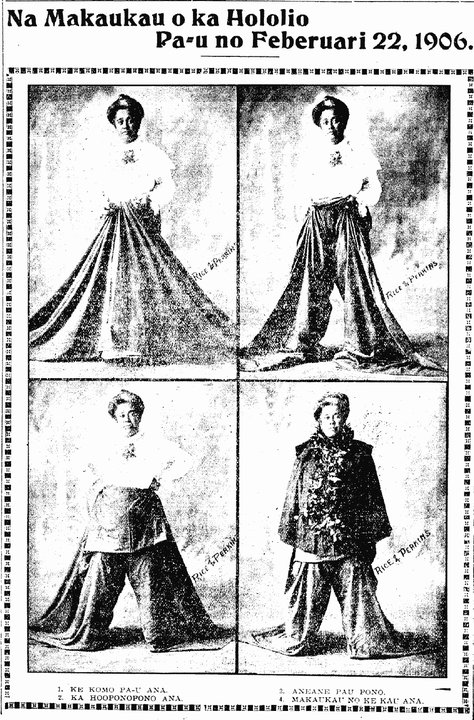 Honolulu Star-Bulletin, Volume XXIV, Number 7674, Page 8. November 15, 1916. King Kalakaua’s birthday to become a new holiday? 1916. THE DAY WAS CELEBRATED BY HAWAIIANS, THE HAOLE, THE LOCALS, AND THE NEWCOMERS, WITH THE THOUGHT THAT IT WOULD BECOME A NATIONAL HOLIDAY IN THE FUTURE. For the first time, a commemoration of the birthday of King Kalakaua held extensively here in this city yesterday; this day will be celebrated in the future as is the birthday of the Conqueror of the Nation, Kamehameha. In years past, there were but a very few people who celebrated this day, but from now on, the birthday of Kalakaua will be a day that is important in the history of Hawaii nei. Pacific Commercial Advertiser, Volume VI, Number 269, Page 2. February 23, 1908. Thirty-four pa-u riders came cantering along in four sections of color: yellow, red, orange and pink, led by Judge Andrade and Mrs. Puahi. The Kaonohiokala Club sent fifteen horse women and the Wakinekona Club eighteen equestiennes. A brave sight they made with their long pa-us fluttering in the breeze and their garlands showing bright in the sunshine. THE ISLAND PRINCESSES, INCLUDING MRS. CHRIS HOLT, OAHU; MISS HANNAH CUMMINGS, MAUI; MISS EMMA ROSE, HAWAII; MISS KAPAHU, KAUAI; MISS BLACKWELL, MOLOKAI; MISS ROSE GIBSON, LANAI. 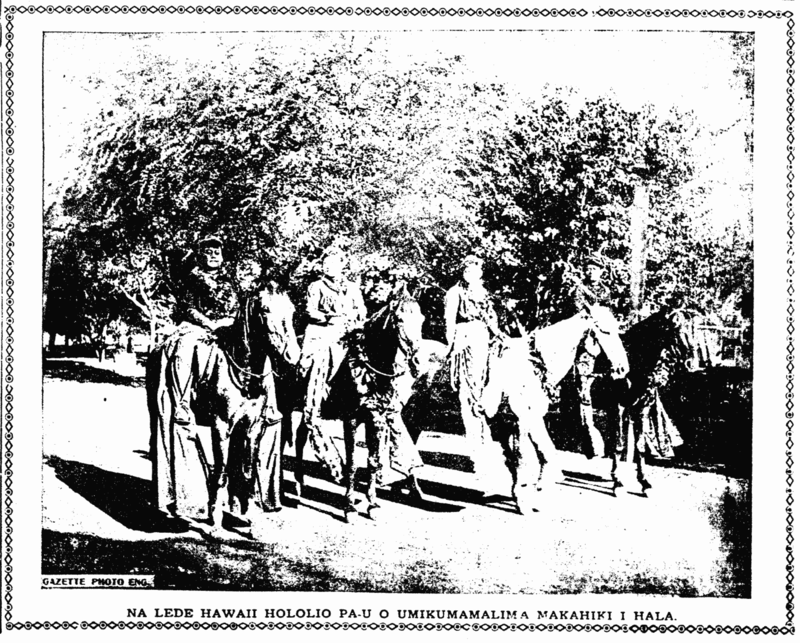 Hawaiian Gazette, Volume LI, Number 120, Page 5. February 23, 1909. Look back at pa-u riders of the past, 1906. 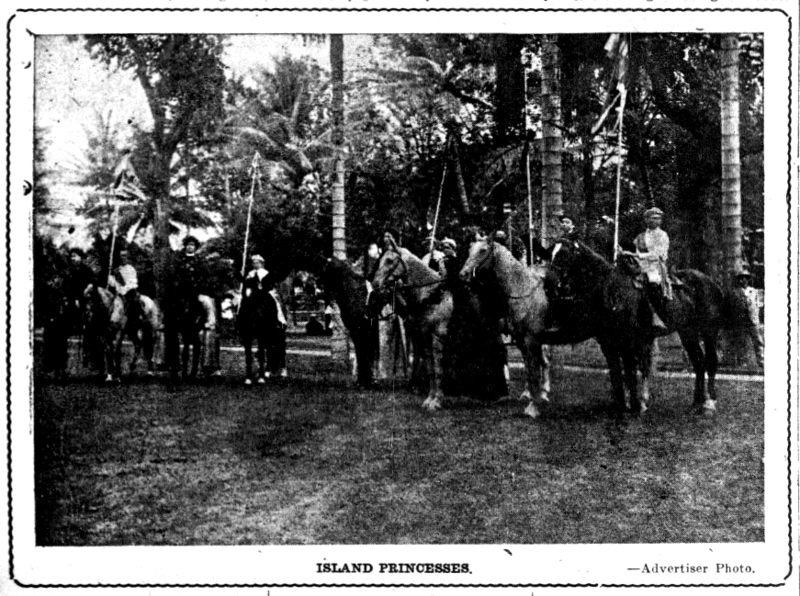 PA-U HORSE RIDING HAWAIIAN LADIES OF FIFTEEN YEARS AGO. Ka Nupepa Kuokoa, Buke XLIV, Helu 7, Aoao 4. Feberuari 16, 1906. Putting on a Pāʻū, 1906. Preparations for the Pa-u Riding of February 22, 1906. 1. Putting on a pa-u. Ka Nupepa Kuokoa, Buke XLIV, Helu 6, Aoao 4. Feberuari 9, 1906.